All the appliances you have in the home operate more reliably, efficiently and, most importantly, safely, if they are installed and serviced correctly. Solid fuel appliances are no exception to this and following these few simple guidelines will ensure safe and efficient operation. The Health and Safety Executive recently issued a warning about the dangers of using redundant back boilers. Carbon Monoxide is a deadly gas which can cause illness, permanent health damage and far too often, death. It is formed by the incomplete combustion of fossil fuels –gas, coal, wood and oil. A certain amount will be formed during the normal process of burning the fossil fuel but the gas is evacuated safety up the chimney and away. However, if your chimney is blocked, or leaking, or if your appliance airways or throat plate are not clear, then the gases will not escape into the atmosphere, but flow back into your house, or on occasion into your neighbours house, through a common chimney, with possible deadly results. It is also important to note that in extreme weather conditions, fumes can be forced back down the chimney. The dangers are greatest with closed appliances. If you are burning a smokeless fuel, you may not see any smoke. Elderly people are often more vulnerable because they have lost their sense of smell and although the gas is odourless, the other combustion products from the fuel are not. Almost all cases of carbon monoxide poisoning with solid fuel are the result of a blocked or leaking chimney or poor maintenance. Follow the advice below to be safe and enjoy your fire. Heating appliances, whatever fuel they burn, need to be able to ‘breathe’ in order to function efficiently and safely. To ‘breath’, they need a constant and sufficient flow of air so the room must not be completely airtight. If your home has draught-proofing or double-glazing fitted you may need vents or airbricks in an exterior wall of the room. If vents or airbricks are already there always ensure they are not blocked or covered. If in doubt contact your local HETAS heating engineer to check your ventilation. Flue Cleaning – To enable your appliance to ‘breathe’ efficiently it is absolutely essential that you do not allow soot or ash to build up where it can hinder or prevent the free flow of smoke and other products of combustion. Empty and check the ash can every day. Flue ways at the back of the boiler should be cleaned once a week, but always let the fire go out and allow ashes to cool before cleaning. The throat plates at the top of the roomheater should be removed and cleaned monthly. Carefully put out the fire, or allow it to burn itself out. Do not attempt to re-light the appliance until a professional has checked it. Always use the right fuel. Never leave an open fire unattended without a fireguard. Always use a securely fitted fireguard when children are in the house. There are potential dangers from barbecues and in particular, the fact that coals that appear to be dead can still emit dangerous carbon monoxide fumes. The HSE have made us aware of two related incidents involving catering establishments where after cooking had finished for the day, unattended charcoal grill ovens caused a build-up of carbon monoxide which subsequently percolated into neighbouring premises and resulted in two cases of carbon monoxide poisoning. This type of charcoal oven should ideally be flued directly to the outside via a purpose built chimney in accordance with Approved Document J of the Building Regulations. 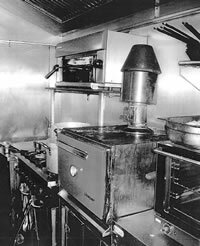 However, we are aware that in some cases, the grill is simply positioned beneath a commercial kitchen extractor as shown in the picture. Lack of proper maintenance can lead to blockage or failure of the extraction system – it is important to follow exactly the manufacturer’s maintenance schedule. Because dangerous products of combustion (including CO) will still be emitted after cooking finishes for the day, the extraction system must be kept working for as long as is necessary to prevent a build-up of poisonous fumes. The oven manufacturer’s instructions for installation, maintenance and use should always be carefully followed.